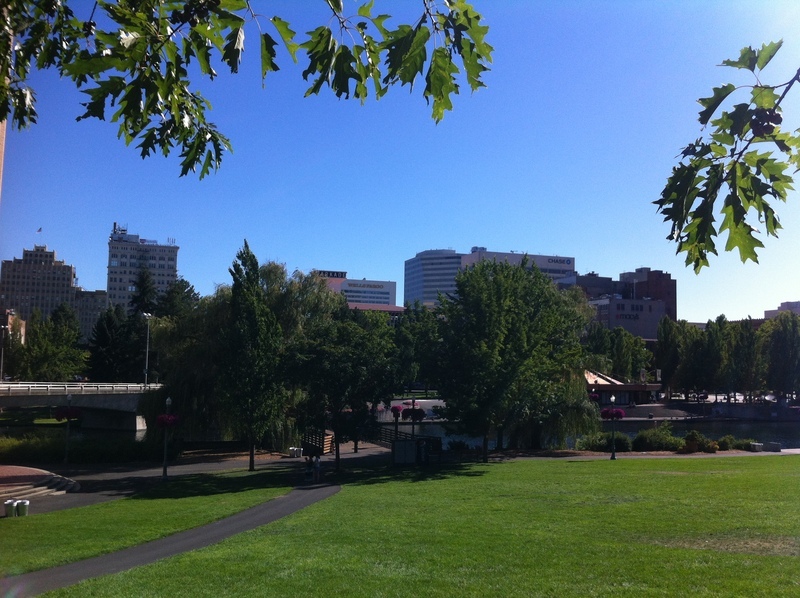 How did Spokane get a hundred-acre park right in the middle of downtown? Riverfront Park was once a tangled mess of railroad tresses and industrial overgrowth. During the 1960s it was hard to even tell that a river flowed through the city because it was largely covered by railroad tracks and parking lots. 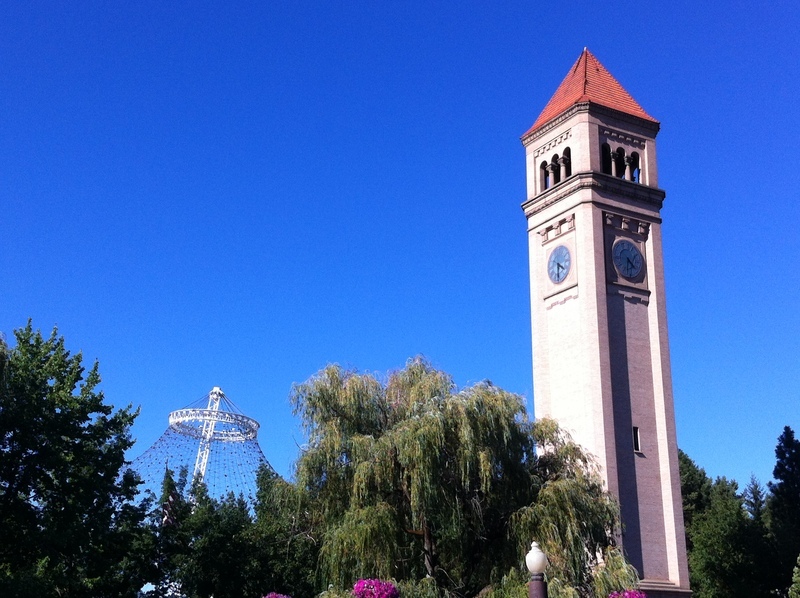 The story of Riverfront Park is a story of several influential Spokanites whose goal was to rejuvenate Spokane's central business district and reclaim the beauty of the river. Downtown Spokane had experienced a depression following WWII. The downtown retail stores were losing customers to the new shopping malls in the suburbs. Cars replaced trains, leaving the downtown railroad stations an empty shells. As downtown buildings fell into disuse and disrepair, shoppers were replaced by homeless persons, and urban blight set in. 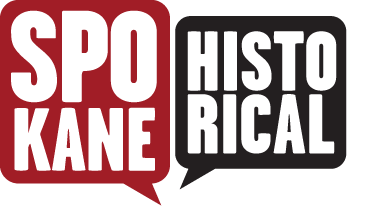 In 1959, Joe Kipper, manager of Sears and president of the Chamber of Commerce, and John Hieber, downtown property manager, created Spokane Unlimited to revitalize the downtown. Spokane businessmen soon joined in, including Kinsey Robinson, president of Washington Water Power, and bankers Charlie Parks and Neal Fosseen. They hired King Cole (see "Expo 74: The Father of the Fair"), a professional city planner, to help them reach their goals. Spokane Unlimited knew it wanted to remove the railroads and leave a city park in their wake, but they also wanted to do something that would benefit downtown businesses. However the costs were enormous. Could Spokane get someone else to pay for the project? 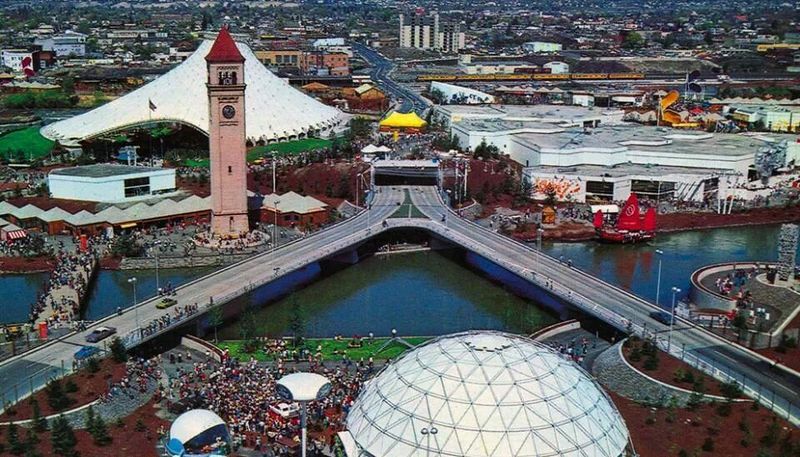 Eventually they decided to try to host a world's fair to accomplish their goals, the sort of project that could draw substantial state and federal funding. Could Spokane pull it off? Never before had such a small city hosted a World's Fair. First they had to gain the property from the railroads. By 1972, representatives of Spokane Unlimited were able to convince the railroads to turn their property over to the city free of charge. With the land secured, members of Spokane Unlimited donated up to $100,000 each to get the project underway. 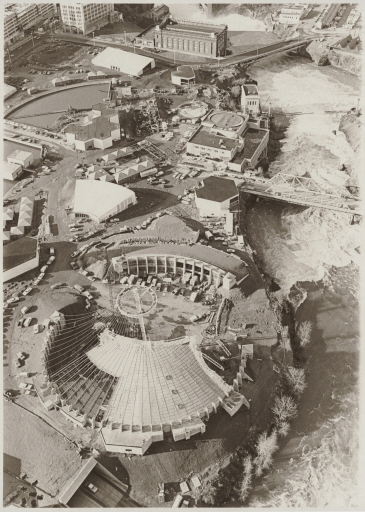 When the fair ended in winter of 1974 and the pavilions had gone, the Spokane riverfront had transformed. Spokane performed a magic trick. In the place of railroad trestles and concrete stood Riverfront Park, and the glorious falls which had been obscured from view for half a century. 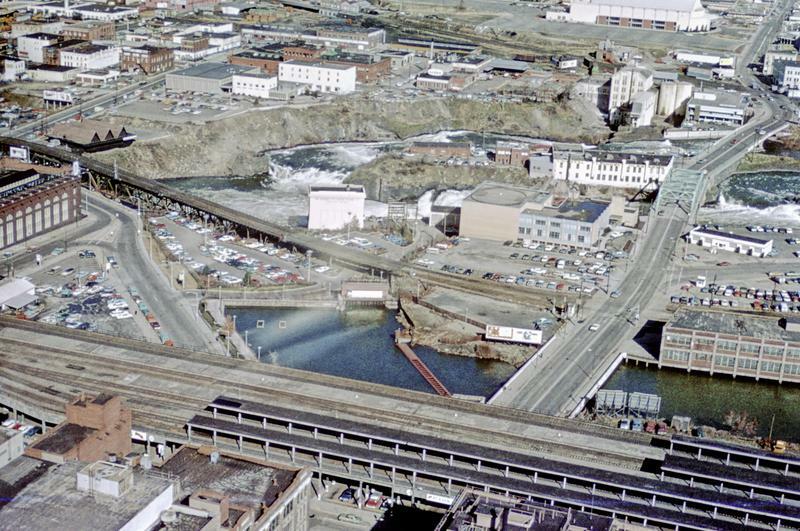 Old Spokane Riverfront : Throughout the 1960's and early 70's the riverfront was largely covered by railroad tracks making the river barely visible. Washington State Archives, Digital. 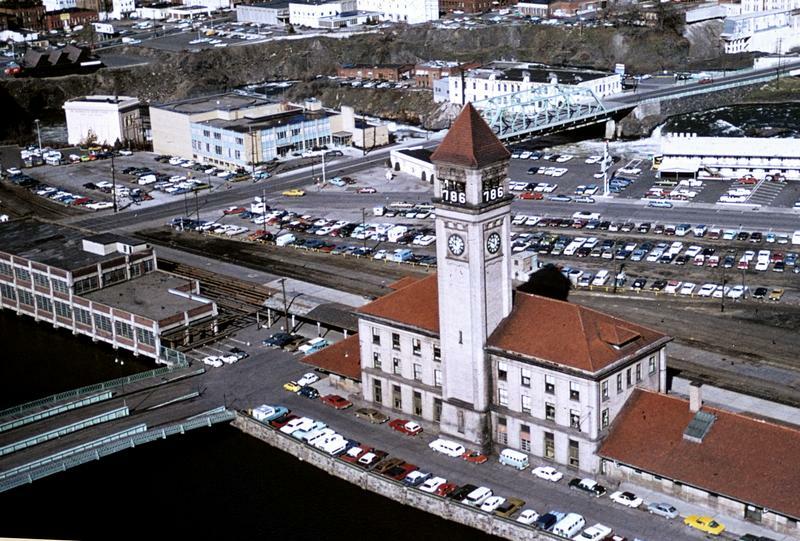 Great Northern Station: This is a photograph of the Great Northern Railroad Station on Havermale Island before the riverfront was changed by Expo 74. The station was removed in preparation for the World's Fair, but the tower remains in its original place. The clock tower is one of the only remaining structures left over from before Expo. Today it is one of the most recognizable features of Riverfront Park. Washington State Archives, Digital. Ray Bowles, a small business owner in the 1970's, recalls his opinions about the proposed exposition. Bowles, Ray. Interviewed by Cory Carpenter. Informal, Spokane WA, 11-2-3013. Cory Carpenter, “Rediscovering the River,” Spokane Historical, accessed April 19, 2019, https://spokanehistorical.org/items/show/387. Stimson, William. A View of the Falls: An Illustrated History of Spokane (Windsor Publications Inc., 1985). Youngs, J. William T. The Fair and the Falls: Transforming an American Environment (Eastern Washington University Press, 1996).